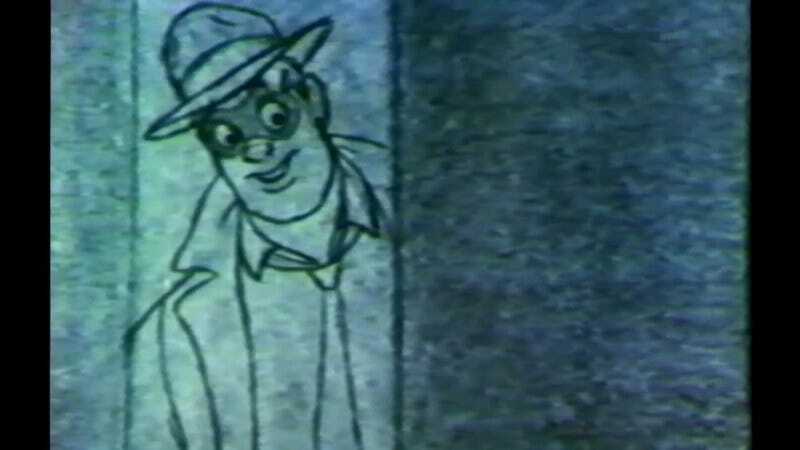 Will Eisner’s The Spirit comic has been influential in its panel designs, graphic representation of titles, and even forming various archetypes of the superhero genre. The strip, which started in newspapers in 1940, has also been very influential to many animators and graphic designers who saw an artist able to marry bold new leaps in layouts with a fun two-fisted tale of a vigilante. It’s not surprising, then, that there have been several attempts to bring the property to the big screen. (Including Frank Miller’s 2008 adaptation that was… less than well-received, let’s say). But what is surprising is that one of the earlier tries at turning Denny Colt’s adventures into a cinematic experience was spearheaded by none other than Brad Bird (The Incredibles, The Iron Giant) and Gary Kurtz (producer of Star Wars). Recently footage has surfaced of pencil tests that Bird and his CalArts cohorts did way back in 1980. The artists are still wearing their Disney influences on their sleeves, but pre-dating the art deco and heavy silhouetted designs found years later in such works as Batman: The Animated Series. It’s a fascinating look at what might have been, and a delight to see some of Bird’s earliest non-Disney work that suggests a Spirit movie without so much of the Nazi imagery or awkward misogyny audiences eventually received.